I know this sounds ridiculous, but decorating kitchen tables stresses me out. I don't want to go too far with the decor, because I hate the thought of having to take a bunch of "stuff" on and off every time I eat a meal. On the other hand, I don't really like the look of a completely bare kitchen table either. How do you strike a perfect balance? Fruit? Plants? Bowls? Pots? Flowers? Candles? 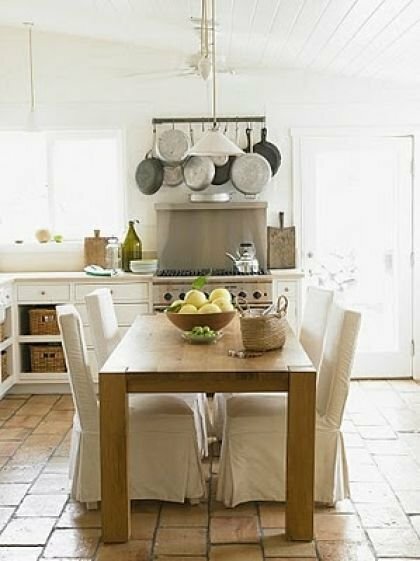 Here are some pretty kitchen table photos that are a good starting point, though I'm still convinced there is a secret out there that I don't know about when it comes to kitchen table decor. HELP! What do you put on your kitchen table?